But fortunately I am at the first day of Campus Party, and the participants are starting to arrive with their computers, robots, astronomy gear, etc. All I really had to bring was by USB key with Linux on it, but I admit to bringing a stuffed Tux and a few other odds and ends. A lot of the participants of this week-long event will be sleeping in tents. 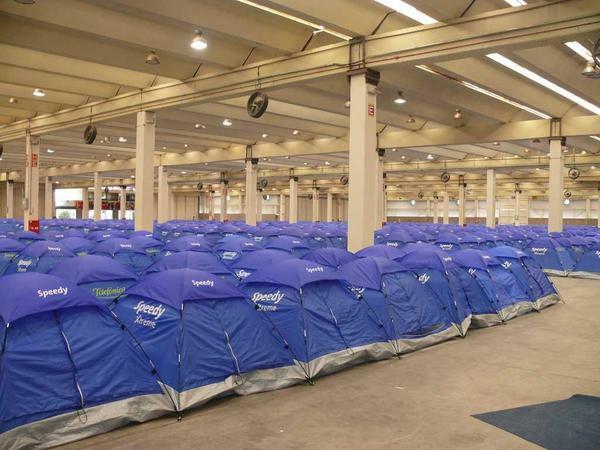 The tents this year were sponsored by Speedy Xtreme and Telefonica, and look like the bottoms of blue egg-crates rising up from the floor of the sleeping area. All of my work for the "maddog Brasilian Multimedia Challenge" is done other than the actual judging. I am excited about this Challenge, since I hope it will show the power of Free Software in areas other than programming and office work. Tomorrow (Tuesday) night we start the actual challenge and the contestants will have two days to develop their entries of a song, video or musical video. I already have been contacted by Giganews (www.giganews.com) to see if they can post the entries to their Usenet archives. I am also meeting (and will continue to meet) old friends here, some of whom I have not seen for several years.